Palestinian Centre for Human Rights wins France’s highest award for Human Rights endeavours. The Palestinian Centre for Human Rights has been granted the Human Rights Award of the French Republic, “Liberty, Equality, Fraternity”. This award – the most prestigious honour France grants for human rights endeavours – is to be shared with the Israeli group, the Public Action Committee Against Torture in Israel. For the first time ever, it will be presented by the President of France, M. Jacques Chirac, at the Elysée Palace on 10 December 1996. Mr Raji Sourani, director of the Palestinian Centre, and Ms Lea Tsemel, of the Public Action Committee will receive the awards for their institutions. The Public Action Committee Against Torture in Israel was established in 1990 and focuses on the use of torture and ill-treatment practised by Israeli security services against Palestinians under detention. The use of physical and mental abuse is contrary to international law but has been legalised by the Government of Israel. Concomitant to its work is the importance of having a truly democratic Israeli state, in which basic principles of humanity are respected. The Palestinian Centre for Human Rights was set up in April 1995 to monitor and document the practices of Israeli military forces in the Gaza Strip, and the rest of the Occupied Palestinian Territories. The Centre also works within the Palestinian autonomous areas to support moves towards democracy and respect for human rights and the rule of law. During 1996, the Palestinian monitored the Israeli closure of the Gaza Strip and its effects, and organised the largest NGO monitoring unit of the Palestinian elections in January 1996. The award to these two human rights organisations is a measure of France’s unwavering commitment to human rights in the Occupied Palestinian Territories. President Chirac in his comments and his recent visit to the Gaza Strip and West Bank gave a clear message that France sees a sovereign Palestinian state as establishing a part of a peace, in which human rights could be respected. This political commitment of France has been re-affirmed with the support of grassroots organisations with international reputations for confronting Israeli military occupation and for seeking to promote democracy and human rights within their own countries. Monitors and documents human rights violation committed by the Israeli military forces and other abuses associated with Israel’s continuing legal and absolute occupation of the Gaza Strip and West Bank, including East Jerusalem. Promotes democracy and respect for human rights and the rule of law in the 60 percent of the Gaza Strip and 3 percent of the West Bank controlled by the Palestinian Authority. During the last year the Palestinian Centre has documented thousands of cases of human rights violations and provided legal assistance to hundreds of detainees and prisoners. It has also prepared over 30 reports on the human rights situations in the Occupied Territories, on subjects ranging from the Palestinian elections to the Israeli military closure of the Gaza Strip. Raji Sourani, director of the Palestinian Centre for Human Rights, was the 1991 Human Rights Laureate of the Robert F Kennedy Memorial for Human Rights. The work of the Palestinian Centre is supported by: Swedish International Commission of Jurists, Ford Foundation, Open Society Institute, NOVIB, Royal Norwegian Ministry of Foreign Affairs, Agir Ensemble Pour le Droits de l’Homme, DanChurchAid, Canadian Embassy, Christian Aid, Netherlands Commission on Interchurch Aid, Grassroots International, the Resource Centre for Non-Violence and the Robert F. Kennedy Memorial Foundation. The Palestinian Centre for Human Rights and the Fédération Internationale des Ligues des Droits de l’Homme will hold a press conference at 15.00 hours on Tuesday 10 December 1996 at the Federation offices: 17 Passage de la Main d’Or, Paris 75011. The Centre will release an 80-page report on the use of the Israeli military closure on the Occupied Territories. 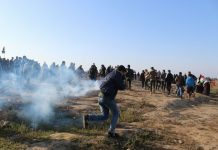 Also to be released will be a summary of the findings of the Palestinian Centre’s investigations into the clashes of late September in which over 60 Palestinians were killed and over 1,600 wounded. The full report, to be published next week, gives an account of Israeli Government and military responsibility for the clashes and bloodshed of late September. The President of the French Republic will decern, on December 11 1996, the Human Rights Award of the French Republic to the institutions elected by the National Advisory Commission of Human Rights as Award winners for 1996. Mr Jacques CHIRAC will personnally give the Award at the Elysee Palace to the Israeli Lawyer Lea TSEMEL, and to the Palestinian lawyer Raji SOURANI. The Public Action Committee against Torture in Israel and the Palestinian Centre for Human Rights which they represent have been jointly awarded by the National Advisory Commission of Human Rights and will share the Award (100 000 FF, approximatively 20 000 $). This independant body, chaired by Mr Jean KAHN, is composed of representatives of Human Rights NGO’s, Trade Unions, Human Rights experts, two members of Parliament and the Mediator of the French Republic (Ombudsman). It advises the Government on questions pertaining to Human Rights issues and humanitarian action. Representatives of Prime Ministre and other Ministries also participate in the Commission’s work, without no right of vote. – “Lawyers without border” (France) for a programme on prisons and detention in Rwanda. The Palestinian NGO Al Haq is one of the previous winners. In 1994, it received the Award with other winners such as Mrs Taslima NASREEN or the International League against racism and antisemintism.